Fashion girls and Levi's jeans go together like peanut butter and jelly, French girls and berets, and, well, you get the picture. We've already shared the magic of the celebrity-adored 501 jeans, but there's a brand-new shape that just launched, and it's already a hit among the stylish NYC crowd (and this L.A. editor). Aptly dubbed the Ribcage style, the jeans offer the highest rise on any Levi's to date—and at 12 1/8 inches, the ribcage-grazing waistline puts other high-waisted jeans on the market to shame. 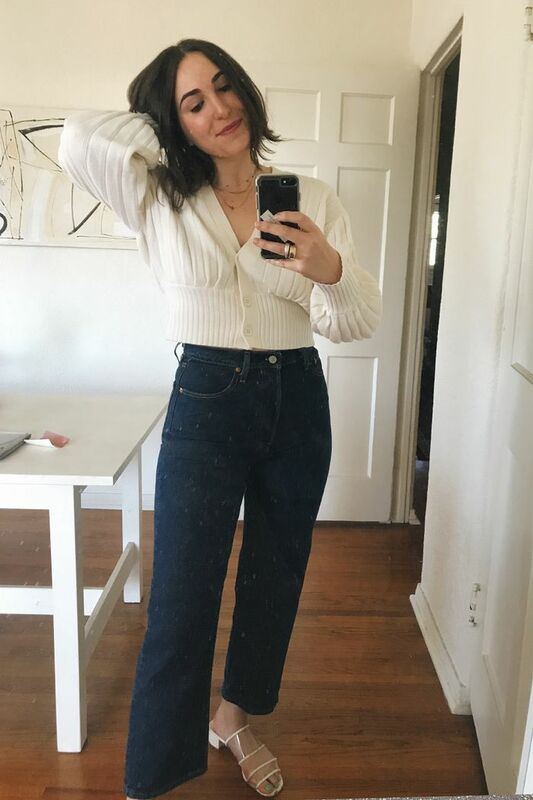 The name makes them sound scary, I know, but once I buttoned my pair all the way up to my belly button and walked toward my mirror, it became immediately clear that these were the most slimming (and comfortable!) jeans I had ever worn. It turns out they were designed to fit that way, according to Global Chief Product Officer Karyn Hillman. "Authentic look and feel inspired by a '90s Levi's 501 with the modern amplified rise is so flattering—perfectly styled high or low," she says. Now that I own the dark-wash pair (scroll down to see them on), I'll be waiting patiently until Levi's drops new silhouettes this spring in straight leg, split flare, and pleated crop styles. Scroll down to see the jeans on me, along with the NYC girls who adore them, too, and then shop the current Ribcage styles on offer. totally not wearing this outfit for the third day in a row or anything. Speaking of new denim trends, see which style has completely vanished from last year.